Footprints of a Different Kind: We’re featured in CHIC magazine! We know that we have left footprints during our many muddy, dusty walks, but we never thought that it’ll extend to the press! Such a lovely surprise, CHIC magazine picked our travelogue to be featured in the ‘blog review’ of its January edition. 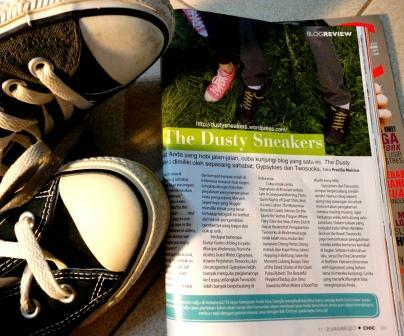 The article summed up our stories nicely and we’re especially touched by its acknowledgment of our time apart and the reunions that followed – the meta-story of The Dusty Sneakers. Thank you, CHIC, and thank you, Precilia Merisa, for appreciating and enjoying our accounts! Haha ini pasti anak Platform! thanks ya, semoga sempat reunian. Keep writing!